Florida residents enjoy some of the best weather in the country. Unfortunately, our mild winters and sunny weather are also coupled with severe weather, most notably hurricanes. Are you prepared in case a storm knocks out the power to your Palm Beach, Broward, or Martin County home for several hours or even days at a time? Wise home and business owners recognize the value of backup generators and the peace of mind they offer. Reliable Power Systems has been in the power generator business since 2002. We are committed to providing our customers with dependable generator installation to ensure backup power in case of an emergency. Looking for generator installation companies “near me”? If you’re located in Palm Beach, Broward, or Martin County, Reliable Power Systems has you covered! Contact us today to learn more about generator installation and replacement services in Florida. A backup power generator is a piece of equipment that’s permanently installed outside your home. It only operates during a power outage, using your home’s regular power source (natural gas or propane) to keep the lights on and appliances running. The high-quality generators from Reliable Power Systems have a monitoring system that automatically switches the unit on when the municipal power supply goes down. Once power is restored, the generator shuts off. Can I Use a Gas Generator from the Hardware Store? These temporary portable units contribute to another risk during hurricane season: carbon monoxide poisoning. Improper setup could endanger your family, which isn’t the case with permanently installed backup power generators. Portable units are also less efficient than those available from Reliable Power Systems. Even our smallest units will keep your food cold and a few lights on while ensuring your family’s safety. How Does Generator Installation Work? When you call for your free quote, we will come out to evaluate your home and the needs you have for power in the event of a weather or electric emergency. Once we have customized a plan to your home, and you approve it, we will pull all of the necessary permits. We will come out and install the system with as little interruption to your life as possible. Once the system is installed, it will be tested by the installer and then again by your salesperson. We will also make sure you are comfortable with your system before we leave. What Are the Top Home Generator Brands? We recommend the 22kW Guardian Series home standby generator from Generac. This recently released model is one the most advanced of its kind. The 22kW Generac standby generator is the largest air-cooled residential model on the market, with the ability to provide efficient, whole-home coverage at the lowest cost per kilowatt of any air-cooled home standby generator. Reliable Power Systems was among the first Generac-certified companies granted authorization to sell and install the 22kW generator when it first became available. The 22kW Generac standby generator is just one of the many state-of-the-art home generators we can provide our customers. We guarantee that all of our products are among the best-in-class, top-of-the-line generators available anywhere! Why Work with Reliable Power Systems? We have provided trustworthy, customer-centric electric and generator services to Palm Beach, Broward, and Martin counties since 2002. All of our technicians are fully licensed, trained, and certified, including our company founder, Robert Biscardi, who is a state-certified master electrician and certified gas installer. Our company has been named a Generac Premier Level Dealer: “Best in Class,” ranking us among the top dealers in the nation. 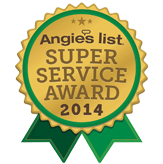 We were awarded the coveted Angie’s List Super Service Award in 2013. For answers to any remaining questions you have about buying, installing, or replacing a standby generator in your Florida home, please contact Reliable Power Systems and schedule an expert consultation today.